Journalistic good fortune of being in the right place at the right time continues to follow The Peasant From Less Sought After South Reston. While stepping out this past Saturday evening with Mrs. Peasant for a culinary feast at Cafesano in the South Lakes shopping center, what did we see while driving down Twin Branches but...a newly-deceased beaver corpse on the side of the road opposite the eastern end of Lake Audubon. Stopping to further examine the crime scene, we found this specimen of Castor canadensis belly up by the curb, and when we say belly up, we are talking about a very full belly (perhaps this critter had been drag racing WSSI to see who could clear-cut the Snakeden watershed faster). We also observed that the dental profession in Reston is missing a golden business opportunity, because not only was this critter orthodontically-challenged but his one visible tooth was a bright shade of...non-DRB approved orange that just begged for a teeth-whitening procedure. (One can only imagine the conversation back at the beaver lodge that Ma and Pa Beaver must have had with their young 'un about this: "Dagnabit, son, keep eating that junk food you find around the 7-11 on Soapstone and your teeth are going to rot out!"). Now a dead varmint on the side of the road would not normally be newsworthy; witness the squeamish squishing of squashed squirrels that occurs non-stop all over Reston's roadways. BUT -- as faithful readers of this blog will recall, when The Peasant infiltrated WSSI's March of the Hobbits along Reach 5 of the Glade Stream on April 18, the only brouhaha among the assembled tree-huggers was caused by the issue of "the beaver area", to use WSSI's somewhat inelegant term for the swamp created by these critters a while back. 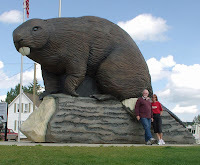 The tree-huggers had been told that the beavers who once lived there were long departed; even Wizard Mike of WSSI claimed he could not control these critters. After the heated discussion at the Hobbit March between Mr. Know-It-All and Granola Crunching Granny about these varmints, there is something almost...karma-like..about this dead beaver sighting. So...we are left with the mysterious case of the dead beaver on the side of the road at Twin Branches. We can only speculate that A) it is Reston's version of the swallows returning to San Juan Capistrano; B) this was a navigationally-challenged beaver who took a wrong turn on his way down to the Tidal Basin to pull a George Washington and chop down some more cherry trees, or C) WSSI, having listened to community concerns, is going green. Instead of using skidders, backhoes, chain saws and the like to clear the next reach of the Glade Stream of those pesky trees, they are importing Mother Nature's own little Corps of Orthodontically-Challenged Engineers to do the work. What's not to like with this plan? Zero carbon emissions, zero decibels, and zero protests from those annoying tree-huggers! It's another only-in-Reston story that makes us proud to live in our beloved mauve-colored New Town. Let's just hope the beaver wasn't infected with the swine flu. And you call yourself a South Restonian. I would like to see a beavers in our stream.